Via Felix Salmon, I see that Tim Geithner has unveiled his plan — or, more accurately, his guiding principles — for regulating leverage more effectively in the financial industry. And it’s not bad. Basically it requires (a) stronger capital requirements across the board; (b) higher capital requirements for bigger firms, which would make larger firms somewhat less profitable; (c) an emphasis on real capital, not shell games; (d) higher capital requirements in good times and lower requirements in bad times; (e) a simple leverage constraint as sort of a backup to the more complex main capital rules; (f) stronger regulation of off-balance-sheet vehicles; (g) some kind of minimum liquidity requirement so that banks can’t be wiped out in just a matter of days by a bank run; and (h) extension of all these rules to big non-banking entities (the “shadow banking” system). All of these are described in general terms, and I note that (h) is described in especially dodgy terms. 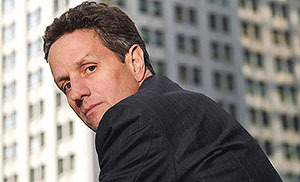 So we won’t know how serious Geithner is about this stuff until he rolls out the details. But at least he seems to singing the right songs.